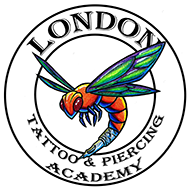 Choosing the Tattoo & Piercing courses at the London Tattoo Academy was my best decision! I love it! Thank you Sabrina and Buddy!!! You are the best of the best!!! Recently completed the Body Piercing course in London held by Sabrina & Buddy. Cannot recommend these guys enough. Genuine, passionate and down to earth couple that have nearly 30 years experience in the business. They really take their time to explain things to you and make sure you understand. Even after you go away from the course you have all the support you need to help get you on your way with your tattooing/piercing career. Worth every penny. Thanks for everything guys! Unlike most of the classmates, I was totally a tattoo idiot before I’ve stepped in the classroom. I have been admiring tattoo art for long, so I decided to learn properly instead of watching load of videos which might be substandard. I sent out the enquiry email to Sabrina and got respond from her promptly, whereas the other academy has no reply at all😤. Anyway, communicating with Sabrina just like a breeze. Clear and quick. No hassle at all.👍🏻👏🏻🙌🏻⭐ To be honest, I have never seen a tattoo machine in real before the class started. I was worrying 😭that I might could not catch up the speed of the class. Nevertheless, my worried was totally superfluous 😬😬 Buddy, the tattooing trainer, who taught us unreservedly and patiently which really an astounding. ☺ Besides the 10 days tattooing course, I signed up for the 2 days piercing course as well. Sabrina is the trainer of this course. Her class was really comprehensive and applicability. We did alot of practices with her guiding which really built up our confidence. 💪🏻💪🏻👊🏻👊🏻 Lastly, the location and the atmopheric of the academy is great. Three minute walk from Berrylands station and bus station just at the corner. Free 1 day refresher course for graduated students which is superb. Free parking on street and cafe☕ Pub🍺takeaway 🥢 all are near. Many thanks to Buddy , Sabrina and all the supports from my lovely classmates. Highly recommend this awesome academy. In 2011 after the recession had blown the trades out of the water, I found myself without work and any chance of it for the foreseeable future. My personal circumstances didn't allow emigration at the time, so I had to think outside the square on how I was going to make a decent living. Having had several tattoos done over the years I'd always had an interest in them and was fascinated by the skill and artwork involved in doing them. Through the grapevine I heard that Buddy was running tattooing courses so in a way I suppose a light bulb went on. Having seen shows on tv about the tattooing industry and the amount of opportunities that could potentially open up, in particular the possibility of travelling and doing guest spots around the world I signed up in 2012. From the get go it was obvious that Buddy was there to pass on his knowledge and passion for this skill. No question went unanswered, there was no attitude and it was done with warmth and humour. A lot of humour!! But make no mistake, this was thoroughly professional with all facets of the trade covered. At times it was tough, there's a lot of concentration involved but that's another skill to develop and Buddy teaches ways of maintaining this. All in all it was well worth the investment. It's 2018 now and I travel the world doing guest spots and work in Ireland when I'm here. So stop thinking about it and do it. Take the plunge and change your life for the better. "I completed Buddy's tattoo course in 2003 and it was the best decision I ever made as I am now a proud owner of my own tattoo studio. Buddy is a great teacher, he explains how to tattoo in a way that makes it easy and fun to learn. Buddy was always quick to respond with any questions I had after I finished the course. Thanks so much Buddy!" - Patricia Kelly, Tattoo studio owner. I attended a tattoo course with Buddy back in 2016. I was a bit nervous at the start but Buddy made me feel at home. I was surprised at how much goes into tattooing and Buddy brought me through every single aspect of it. This course helped me get my foot into the tattoo industry and I can't wait to see how far it takes me! I could not recommend the tattoo course enough! In 2009 I went for the 1 day advanced course with Buddy, I learned so much, we went over a lot more than I thought we would, covering so many topics. I couldn't recommend Buddy enough. I done a tattoo course in 2004 with buddy .I saved up enough money from my boring job as a taxi driver and this was the best decision i ever made,i opened my own studio in 2006 and can't thank buddy enough for all the help and support he has given me over the years. I attended 1 of Buddies tatttoo course's in 2015 ,he is an excellent teacher with a head full of knowledge that he obviously loves to teach,always encouraging questions,he is very patient with all of his nervous students and put every1 at ease with a really relaxed atmosphere,the course gave me all the tools needed to become a professional tattoo artist.Having easy access to Buddy after the course finished was a huge bonus with any questions answered within minutes.Was the course worth it,absolutely 1000% yes. Completed tattoo course January 2017 ,Buddy has some mad skills making the course enjoyable fun and jam packed with information,,Buddy is a true gent with experience ooooozing out of every pore,i started tattooing about a year before,,my head was wrecked trying to get my lines done properly my colour work was crap so i decided to take one of his course's,,Buddy was quick to point out that all of my tattooing was crap and gave me a reality check then showed me how to tattoo the right way,I got a job in a local tattoo studio 4 weeks after the course,i still work at this studio and have a reputation for strong lines and bright colour thanks to Buddy. I attended a Tattoo course in February 2018. Wow... What a course I learned more in 2 weeks then I did in 2 years of tattooing. Solid well explained fun excellent guidance in what your doing wrong and how to fix it tips and tricks that you could never find online or anywhere. Buddy and the Sabrina Clif and Jake have it all down to an art made me feel part team as well teaching me a world of there knowledge couldn't be more grateful.